Today our expert guest is J. Kenji López-Alt, who truly followed his passion to create something wonderful and share it with the world. He is the managing culinary director of SeriousEats.com and the author of the James Beard-nominated column The Food Lab, in which he unravels the science of home cooking. 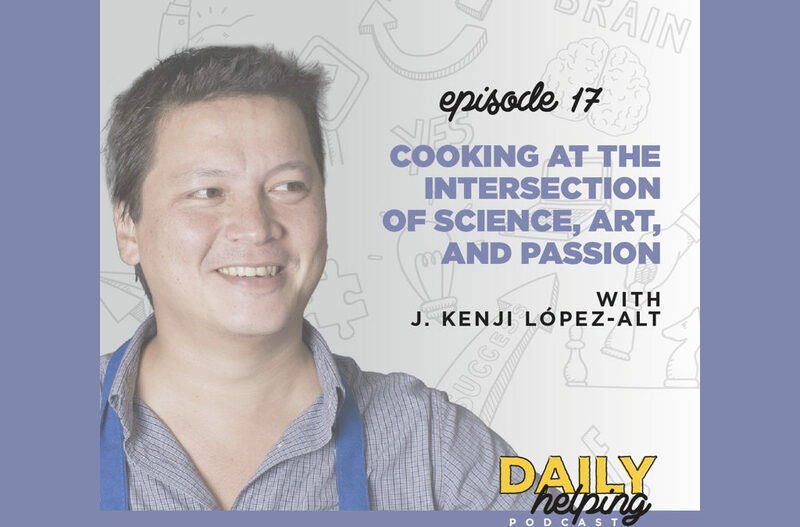 Kenji also wrote the New York Times bestselling book The Food Lab: Better Home Cooking Through Science, which received a James Beard award and was named Cookbook of the Year in 2015 by the International Association of Culinary Professionals. Kenji has achieved and done so much in the culinary world, but he didn’t necessarily set out to do that – he originally went to MIT to pursue a career in biology. However, the field of biology is too slow for Kenji’s taste, and he didn’t want to spend the next 10 years as a research assistant. He took a summer off, looked for a waiting job, and walked into a restaurant that was down one prep cook. He was offered the job and started on the spot. Kenji had never really cooked before in his life, but he loved it. After undergrad, Kenji started working at restaurants full-time… and he had a lot of questions. Why do we double fry fries? Why do we cook pasta in such large volumes of water? Eventually, he found the answer to these questions, and he’s just kept asking questions ever since… except now he gets paid to answer them. As managing editor of Serious Eats, Kenji sees first-hand how the internet is changing cooking culture. The average person is exposed to different kinds of cooking, and just more cooking, that inspire them to do more in their own kitchen, on a daily basis. This universal familiarity with food – the ingredients and the tools – makes the science of food tangible for the average person (more so than, say, biology), and understanding the science of food also helps people elevate the artful side of their cooking. Keep your eyes peeled to kenjilopezalt.com for news about Kenji’s upcoming book, The Food Lab Volume II.